More than 850 permanent and contract workers of air-conditioner manufacturer Daikin India at the Neemrana industrial hub in Alwar district of northeastern Rajasthan have been locked out since January 8, 2019, after a dispute with the company that saw police action against workers. The protesters are demanding better wages and working conditions, and recognition of their workers’ union. I read this article and found it very interesting, thought it might be something for you. The article is called Contract Workers Lower-Paid, More Insecure As Companies Reduce Permanent Hiring https://www.indiaspend.com/contract-workers-lower-paid-more-insecure-as-companies-reduce-permanent-hiring/. Neemrana, Rajasthan: A few 100 metres from the district collector’s office in Alwar in mid-March, some 20 workers of Daikin India, the Indian arm of Japanese air conditioner manufacturer Daikin, raised slogans about workers’ unity. Squatting under a makeshift tent adjoining the road, the group of contract and permanent workers, mostly in their mid-20s, had been protesting since February 2019. The protests are a consequence of clashes that broke out between workers and the police in the industrial hub of Neemrana in northeastern Rajasthan, 90 km south of Gurugram in the National Capital Region, on January 8, 2019. The workers had tried to hoist their union’s flag at the manufacturing facility at the end of a rally attended by some 2,000 workers in the Japanese zone of Neemrana, which was part of a two-day all-India workers’ general strike called by national trade unions. A resultant clash with the police left 50 workers and 22 police injured, The Economic Times reported. More than 850 workers, including 426 permanent and 450 contract workers, have since been been locked out of work. IndiaSpend could not verify these numbers as Daikin India executives did not comment. The conflict is emblematic of simmering distrust between management and workers in India’s manufacturing sector, where more workers are being employed on contract and fewer in direct, permanent jobs -- leading to decline in wages, benefits and work conditions, and reduced accountability for companies even as they increase their profits, experts told IndiaSpend. “Contractualisation has implications for job security, conditions of work, wages, social security, work hours and right to organise including collective bargaining,” said Ashok Khandelwal, a former fellow at the VV Giri Labour Institute and a labour activist, told IndiaSpend. When workers are not provided an employment letter, there is no job security. “The most prominent effect is reflected in the wage ratio in the value addition [wage received compared to value added to a product per worker] continuously coming down,” Khandelwal said. Essentially, this means workers are getting paid lesser for producing more value. At the same time, the share of profits in gross value added has been rising, as per the ILO study, suggesting that companies are earning more profits while paying lower wages. In Rajasthan, where the Daikin protest is under way, the share of wages paid to gross value added by workers in the manufacturing sector fell 23 percentage points to 14.4%, below the all-India average, over three decades to 2012-13, noted a December 2017 International Labour Organisation (ILO) study. “Daikin--the world's biggest maker of air conditioners--was the anchor tenant in the Neemrana Japanese zone, investing $37.7 million (Rs 178.6 crore) when it opened its manufacturing plant to serve the domestic market in 2009,” The Wall Street Journal reported on May 29, 2013. Daikin India has two production facilities in Neemrana, located in the 1,100 acre ‘Japanese zone’. The company saw a compounded annual growth rate of 118% and net sales of Rs 3,250 crore as on March 31, 2018, according to its brochure. The benefits of this growth have not been passed on to the workers, the locked-out workers told IndiaSpend -- tensions have been brewing since 2013 over salary increments for permanent and contract workers, conditions of work and restrictions on unionisation, among other issues. “The increasing use of contract workers who are not employed directly by the employer, but by an intermediary or contractor on short term contracts, reflects significant informalisation of the organised workforce,” the Oxfam report, to be released on March 28, 2019, says. Total employment in the organised manufacturing sector increased 78% to 13.7 million in 15 years to 2015-16, while the share of contract workers in total employment increased from 15.5% to 27.9%, noted a January 2019 report on contractualisation of the Indian workforce by Delhi-based economic policy think-tank Indian Council For Research On International Economic Relations (ICRIER). The share of directly hired workers fell 10.8 percentage points to 50.4% in the same period. At 8.3%, the average growth rate of contract employment was 5 percentage points more than that of regular employment, the study noted. Over 13 years to 2013-14, the percentage of firms which reported no contract workers fell 13 percentage points to 66.8%, the ICRIER report noted. “The disparity between salaries accruing to managers and workers is notable”, the Oxfam report says, “Overall, the average of the share of wages accruing to supervisors increased to 28.6% in 2015-16 from 22.8% a decade prior, a rise of nearly 6%.” Over the same period, the wages of workers -- who outnumber managers 8 to 1 -- fell to 43.2% of the wage bill from 45.1% in 2005-06, that is, by almost 2 percentage points. Further, workers wages have fallen over the years. The share of wages and all non-wage benefits accrued to workers to gross value addition [measure of total output and income] in the manufacturing sector declined from 43.9% in 1980-81 to 23.6% in four decades till 2012-13, while that in Rajasthan fell 23 percentage points to 14.4%, below the all-India average, noted a December 2017 International Labour Organisation study. It is no surprise that most of the growth in employment in the organised manufacturing sector has come via the growth of contract workers as they enable firms to reduce their wage bill, the ICRIER report noted. This has had an impact on conditions of work, as our reporting from Neemrana showed. A couple of kilometers from Daikin’s factory in Neemrana, 23-year-old Sekhar Prasad, a contract worker from Odisha with a diploma in electronics, shares a one-room with an attached kitchenette with two colleagues. He joined Daikin in January 2017. Sekhar is among the contract workers who have not been allowed to rejoin work since the January clashes. “We have been getting financial support from our families to sustain ourselves since we have been removed from work,” Prasad told IndiaSpend. “Some of us have tried looking for other work opportunities in nearby factories, but due to the issue, these companies are wary of us.” He said the laid-off Daikin workers suspect other companies have blacklisted them. Sekhar Prasad (extreme left), Ranjit Netam (extreme right), Topu Mitra (second from right) are Daikin India contract workers from Odisha and Chhattisgarh. They complain about long hours and lack of incentives. Prasad first moved to Neemrana to work as an apprentice at an auto manufacturing company, but the lure of better incentives at Daikin prompted a shift. 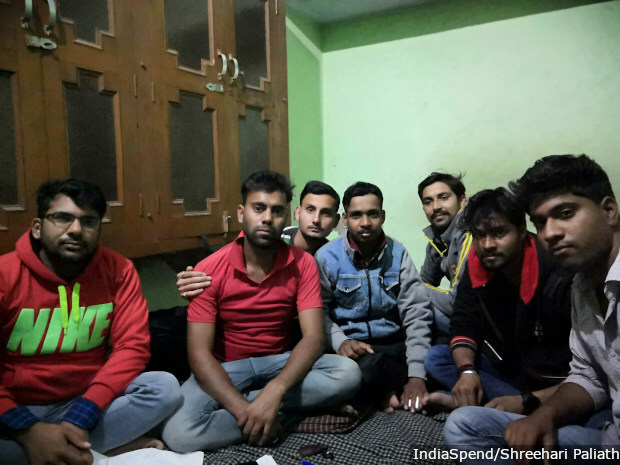 Like Prasad, Ranjit Netam, 24, and Topu Mitra, 22, both contract workers from Chhattisgarh's Kanker district, are worried about their future. Netam and Mitra come from farming-dependent families. They were trained for six months under the Deen Dayal Upadhyaya Grameen Kaushalya Yojana, a central government skilling programme under the ministry of rural development, and joined Daikin in 2016. “For an additional leave of absence, Rs 200 gets deducted from our basic salary even if we have casual leaves available, and we lose the Rs 1,500 attendance award,” said Prasad. Another contract worker, Premchand, 21, from nearby Mahendragarh in Haryana, said he was shocked to learn that he no longer had a job when he returned from his wedding. By making workers ‘rejoin’, contractors give them new worker identification numbers, wiping out their previous record of work at the factory for the purpose of salary increments, etc. This is also one of the methods contractors use to circumvent the rules for terminating workers in “continuous service” under the Industrial Disputes Act. “I came back to the same production line doing the same job, but lost my previous work record,” said Premchand, “There has been only a Rs 1,500 increment since I joined in 2014.” He earned Rs 8,200 a month until locked out. 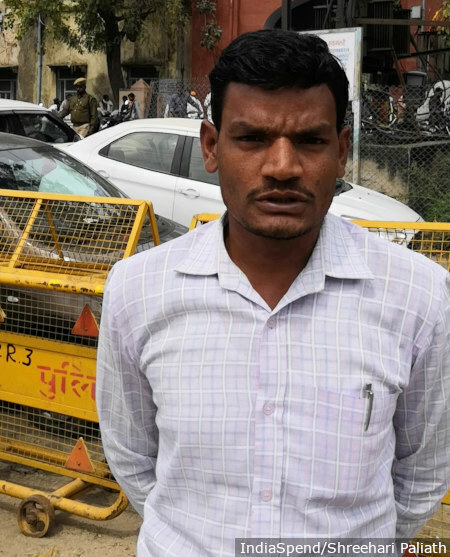 “The management through contractors use any excuse to remove workers so that they can avoid legal issues in the future,” said Mahesh Kumar, 31, a permanent worker who joined Daikin in 2010 and is secretary of the newly registered Daikin Air-conditioning Mazdoor Union (DAMU). Permanent workers enjoy more rights under the law, such as a higher salary and benefits, which allow them more freedom to speak up to supervisors compared to contract workers. Suspended since the January protest, Kumar said the company had undertaken, during mediation talks, to take back 350 permanent workers who have no cases against them or have not been suspended. 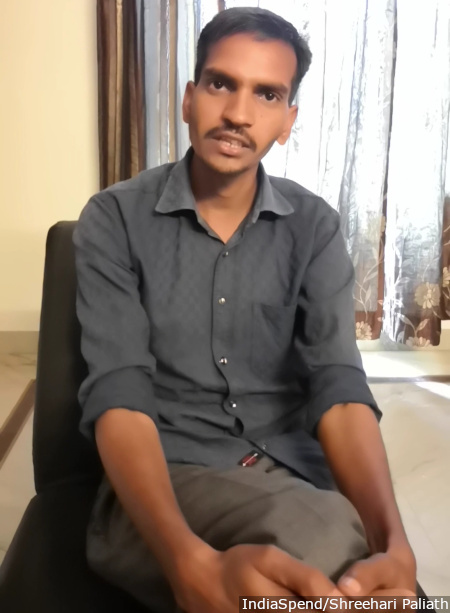 Premchand, 21, lost his job at Daikin India because he took a few additional days of leave after his wedding. He was told he could rejoin later. Deepak Kumar, 28, a contract worker from Behror near Neemrana, was designated a ‘helper’ in the assembly line for heat exchangers. “Although we are working as ‘helper’, the job we do is that of an operator which is a permanent worker’s job, he told IndiaSpend, “A permanent operator gets close to Rs 18,000 depending on the grade, but we get much less.” Kumar’s last salary was Rs 8,500, which included a Rs 1,500 increment when he joined in March 2015. Over three years to March 2018, there were no further increments besides performance-based incentives related to quality, safety and production. Deepak Kumar (extreme left), a contract worker from Rajasthan says that permanent and contract workers are paid different salaries for the same job at Daikin India. He has not been able to go back to work after the clash between workers and the company and police on January 8, 2019. Both permanent and contract workers work eight hours and 50 minutes a day, with two 10-minute tea breaks and 30 minutes for lunch. The workers are expected to be in line two minutes in advance for tea so that they can be back in time for production to begin. For lunch, they spend at least 12-15 minutes waiting to be served and get 10 minutes to eat before getting back to the production line, workers told IndiaSpend. “You can imagine how much time we get to drink, eat or take a toilet break during this time when we have close to 300 people waiting in line,” said Mitra from Kanker. Further, workers told IndiaSpend, despite a deduction from their salary for medical benefits under the government’s Employees’ State Insurance Scheme (ESI), their contract agencies have not provided them ESI cards, without which they are unable to access medical benefits. Contract workers end up paying out of pocket, and do not complain about being denied ESI cards -- or against other unfair conditions -- for fear of losing their jobs, they said. Although some workers are hired through contract agencies or contractors, the general trend in the industrial belt is to hire workers at the company gate, Amit, an independent researcher and trade union activist who has been working with DAMU and goes by one name, told IndiaSpend. Once the recruitment process is completed by the company management, a worker is placed under different contractors, he added. Usually a contractor gets a salary and a commission for each worker employed. This is based on the salary of the worker. “The company informs us verbally about their requirements and once the recruitment formalities are completed, we employ the worker,” Vikas, a contractor, told IndiaSpend briefly before he declined to comment further or give his last name. The management claims it has no liability if a worker is terminated, saying the matter is between the worker and the contractor, according to Mahesh Kumar of DAMU. While trainees and contract workers enable companies to pay lower remuneration, the violate the Supreme Court’s direction on equal pay for equal work. NEEM trainees’ stipend is much lower than the minimum wage and they are unable to raise a complaint under labour laws because they are workers, Amit said. If we speak out against the management about work conditions, they threaten us with termination, workers told IndiaSpend. Which is why workers unionise, to have more negotiating power against the management. But this is becoming harder, too. Daikin’s permanent and contract workers had been demanding an increment in salary, regularisation of contract workers, and medical benefits, among others, since 2013. In order to strengthen their chances of collective bargaining, they decided to form a union and file for registration in 2013. “Alongside salary increments, the need to make contract workers permanent was a priority in 2013. This is a matter of solidarity between both set of workers,” said Manmohan Rajpurohit, 28, a former permanent worker at Daikin who said he was terminated in 2013 due to his work in the union. Though no longer employed at Daikin, he has continued to be associated with the workers’ struggle to unionise. Manmohan Rajpurohit, 28, was a permanent worker at Daikin who was terminated following the first attempt to unionise in 2013. He continues to be associated with the Daikin workers’ movement. Rajpurohit, who is the eighth of 10 siblings from a farming family in Nagaur, Rajasthan, joined Daikin in 2010 as a trainee. After a two-year traineeship and another six months of probation, he was made permanent. Among five selected from more than 150 candidates, Rajpurohit was given an initial salary of Rs 4,700 when he joined in 2010. We were given an increment of Rs 500 in 2011 as per the agreement, he told IndiaSpend. Subsequently, in 2013 workers were given increments of between Rs 75 and Rs 175. There were around 400 contract workers, 175 permanent and 300 trainees, he said. “This is when we made our first protest and decided to register our union,” he said. As a consequence of filing for registration of the union in June 2013, 125 permanent workers were locked out, he said. In October 2013, workers declared a hartal (strike), demanding Daikin resolve the matter. Meanwhile, Daikin obtained a legal stay on the registration of the union from a civil court in October 2013, and the case is now in the Supreme Court. In February 2015, workers put forward a set of demands including better pay, working conditions and health benefits, following which 15 permanent workers were terminated without enquiry, Rajpurohit said. Fearing such arbitrary terminations, the workers filed anew for union registration in August 2016. This is why there was tension when workers tried to hoist the union flag on January 8, 2019. In the resultant clashes, 35 workers were arrested, who were released on bail on March 26, 2019. There have been similar rallies before, but the police were underprepared because they expected it to be peaceful, Ajay Singh, the station house officer (SHO) at Neemrana police station, told IndiaSpend. He recently replaced the SHO who was in charge when the incident happened, and said he had not much further information on the matter. Terming it a law and order issue, he said police are investigating it as a case of damage to police property and Dakin’s property. The workers alleged that company-hired ‘bouncers’ were involved in the clashes. Although the police have not received an official complaint on this, it is being considered, Tejpal Singh, additional superintendent of police in Neemrana, told IndiaSpend. While workers like Rajpurohit continue their struggle, experts believe that legal loopholes and profit motives push up contractualisation. In 2014, the Bharatiya Janata Party government in Rajasthan introduced amendments in labour laws including the Industrial Disputes Act (IDA), Factories Act and Contract Labour Act, which changed the law for retrenchment and recognition of unions, and effectively increased the minimum number of workers for a unit to come under the purview of the law. A section of academic research has pointed out that rigid labour regulations, in particular chapter VB of the Industrial Disputes Act that deals with retrenchment, have pushed companies to increase contractualisation -- by hiring contract workers, factories are able to remain below the threshold of workers at which the Industrial Disputes Act comes into force. States classified as having flexible regulations, such as Rajasthan, Uttar Pradesh, Andhra Pradesh, Karnataka and Tamil Nadu, have witnessed sharp increases in contract hiring, the ICRIER report noted. The share of contract workers among total workers in Rajasthan increased 17 percentage points to 40.8% in 13 years to 2013-14. The Contract Labour Act of 1970 says contract workers can be employed only for peripheral activities and not core activities, but anecdotal evidence suggests this is not typically adhered to, Kapoor said. The numbers (like minimum number of workers to enforce a welfare benefit) and money (maximum wage ceiling for employer welfare benefits like Employee Provident Fund) filters in these laws are meant to help the employer and not labour, Khandelwal, the labour activist formerly with the VV Giri Labour Institute, told IndiaSpend. When you have a minimum threshold of workers instead of “universal application of laws”, it facilitates an increase in contractualisation, he said. Although in many cases workers can take the employer to court, the time taken in the judicial process and costs involved are a deterrent, he added.